Year in and year out, our excitement continues to build as the pick-your-own season reaches its peak. The experience and the bond it fosters between families’ embodies what we believe: growing happiness with good food. We’re particularly excited about the pick-your-own cherry season this year after we lost last year’s crop to an unusual freeze. This year, we’re looking at the beginning of June for prime cherry picking season to begin. You and your family can enjoy our homegrown West Virginian sweet or tart cherries for only $3.09/lb. or if you pick 10 lbs or more, the price is reduced to $2.79/lb. So why should pay us a visit for these delectable treats? 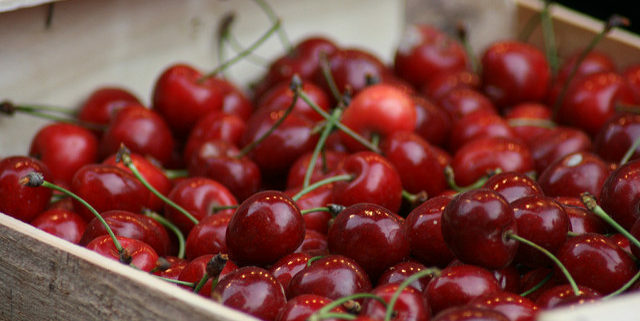 Not only are they fun to pick, but cherries are one of Mother Nature’s most prominent superfoods. Much like other fruits, cherries have huge health benefits. That being said, go ahead and let yourself indulge in a milkshake every once in a while…as long as it comes with a cherry on top! Toss the cherries in a large bowl with ½ cup sugar, the rum, vanilla, cinnamon, salt and 2 tablespoons flour. Transfer to the prepared baking dish. Whisk the remaining ¼ cup flour, the oats, almonds and the remaining ¼ cup sugar in a medium bowl. Stir in the melted butter until combined, then sprinkle the mixture over the cherries. Bake until the filling is bubbling and the topping is golden brown (50 minutes to 1 hour). Let cool slightly before serving. The pick-your-own cherry season is one you won’t want to miss. Stop in our market today to pick up your fresh produce. Visit us online, or give us a ring at (304) 263-1168 for additional crop and produce information. We look forward to seeing you and your family this season down on the farm. Photo Credit: Quinn Dombrowski. Licensed under CC BY 2.0. We’re in the middle of May, and that means the good times are ready to roll. Our beautiful berries are hangin’ out on the vine, waiting to stain your fingers with their sugary goodness. Plus, in a few more days it’ll be Memorial Day—time to get the grills fired up and pile the picnic tables with all your cookout favorites. 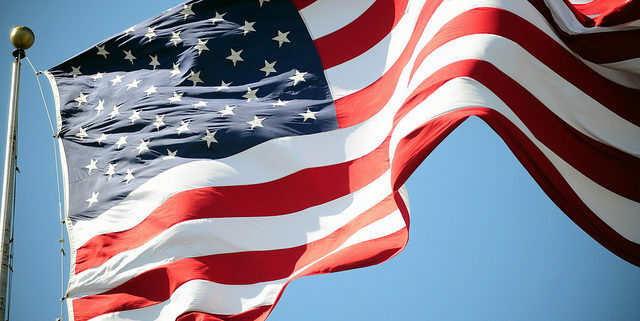 The upcoming holiday is a time to remember those who’ve bravely served our country. As a way to thank our veterans for their service and members of the armed forces for their sacrifice, we offer a 10 percent discount daily when they show their military i.d. Memorial Day is also a day to get together with friends and family and just be simple, soaking up the good company and sunshine. Those good-time gatherings fit right in with our mission to have an important role in our community. We love knowing that our produce and products find their way into your celebrations. Farming takes a team effort—a big one! From planting season through harvest, we’re in it together here. Whether it’s cultivating crops or sharing a meal, one thing is obvious: Food brings us together. And that’s a very good—or berry good!—thing. Local steaks from Blonde Farm. Right out of Inwood, this local beef will be a grilling favorite! Bison burgers. Born and raised at Orr’s bison meat is lean and rich in flavor. Get Bison recipes from our Pinterest page! Berries—of course! They’re sweet enough on their own, or dress them up however you like best—topped with whipped cream or in a decadent dessert. Jams and jellies. These are great in desserts or marinades. You can also use them in oil-based dressings for pasta, veggie, or lettuce salads that need to stay fresh in hot weather. If you’re short on time, save yourself the trouble and choose from one of our many varieties. Order by phone or online. Put an oven rack in the center of the oven. Preheat the oven to 350 degrees F. Butter an 8 by 8-inch glass baking dish. Set aside. For the filling: In a medium bowl, whisk together the lemon juice and arrowroot until smooth. Add the strawberries, peaches and brown sugar. Gently toss until the fruit is coated. Pour the fruit mixture into the prepared pan. For the topping: In the bowl of a food processor, combine the flour, oats, almonds, brown sugar, cinnamon, and sea salt. Pulse until mixed. Add the butter. Pulse until the butter is the size of peas. Sprinkle the mixture over the filling and bake for 40 to 45 minutes until the filling is bubbling and the top is light golden. Cool the crumble for 5 minutes. Spoon the warm crumble into bowls and serve with a dollop of whipped cream or ice cream. Big news! Picking Season is here! We hope you’re planning to visit the farm for pick-your-own strawberry season! This year we’ve planted two varieties, “Sweet Charlie” and “Chandler,” which will be available for about three weeks. Bring the kids, grandma, grandpa—all are welcome. Picking is a fun family activity with a sweet ending! Each year, we use our strawberries in all sorts of delicious ways. You can find many of our creations at the market, or you can enjoy the berries the old-fashioned way— plain and simple, piled up in a bowl or the palm of your hand. Of course strawberries and dessert are a perfect pair, but America’s favorite berry is quite the culinary traveler. If you haven’t gone beyond the traditional strawberry uses, it’s a must-do. And if you need a little inspiration, we’ve got a few simple ideas to get you started. Add sliced strawberries to your salad. Throw in your favorite nuts, some feta cheese, and a protein, like grilled chicken, fish, tofu, or beans. The beginning of our harvest time reminds us of why we’re here. As farmers, our work has many components: We want to grow healthy crops, take good care of our land, and be productive members of our community. Quality. By picking your own berries or selecting from our produce in the market, you know where your food comes from. When food doesn’t travel far, you don’t have to worry about how it was stored and transported. Agriculture. When you take a tour, you get to experience farming up close. You’ll know more about how the food you eat goes from seed to table. Community. You’re supporting a local business, and that’s a great thing. It helps your community thrive by keeping funds local and providing jobs. There are countless benefits to eating locally grown foods, supporting locally owned businesses, and being involved in your community. We can’t do what we do without you. See you soon! https://orrsfarmmarket.com/wp-content/uploads/2017/05/strawberries.jpg 2048 1536 Orr's Farm Market https://orrsfarmmarket.com/wp-content/uploads/2017/03/Orrs_WebHeader_2017-1.png Orr's Farm Market2017-05-09 12:38:592017-05-09 12:38:59Big news! Picking Season is here!